John and I have worked together periodically over a number of years. He manages to combine making thoughtful images that capture something tangible about people and places with an anthropological or ethnographic eye. I invited him to take a series of walks with me for the Leverhulme fellowship and he agreed. Initially, we agreed to walk in London as I was impressed by his Shoreditch Bridge Portraits and felt it resonated with the themes of the fellowship. John had lived in London for many years and, therefore, it seemed apt to walk there. John had delivered a keynote at a conference in Durham on Biographical Sociology and Creative Methods in 2014 and the images he shared were from the Shoreditch project. Shortly after I received notification that the Leverhulme bid had been successful John contacted me to say he would prefer to walk in Chios, where his parents had been born and lived before their migration to Montreal and, subsequently, to London. For John, this was an important moment in history for Greece, her relationship with Turkey, and the refugee crisis. The refugee crisis being played out in the Mediterranean and represented in the media was being experienced starkly in Greece. Bearing in mind Greece’s complicated relationship with Turkey and the Greek nation’s history of forced migration, the crisis was compounded by the effects of severe economic austerity being experienced by the Greek population. The theme of borders, risk and belonging was writ large in this history and in John’s biographical rememberings and so we agreed to undertake the walk in Chios. Before I set off to meet him there he sent me a couple of references to books that might contextualise our journey. The first, Twice a Stranger: How Mass Migration Forged Modern Greece and Turkey (2006) was by Irish journalist Bruce Clark. The second, entitled Austerity Measures (2015) was a collection of contemporary Greek poetry, edited by Karen Van Dyck. These two books, but particularly Clark’s book, became our walking companions, along with Colm Tóibíns Bad Blood: A Walk Along the Irish Border (1987). A review on the back cover of Clark’s book states, “ A brilliant book… Coming from Northern Ireland, Clark is well placed to comment upon this riot of religious, ethnic, historical and political tensions… Anyone with an interest in Greece or Turkey ought to read it”. It opens with this sentence: “Whether we like it or not, those of us who live in Europe or in places influenced by European ideas remain the children of Lausanne; that is to say, of the convention signed on a Swiss Lakeside after the First World War which decreed a massive, forced population movement between Turkey and Greece” (Clark 2007: xi). Religion was the criterion for ‘population transfer’ in 1923. Christians and Muslims were forcibly moved and Clark undertakes to write a book that investigates the impact of the Lausanne treaty on the economics, politics and culture in both countries. 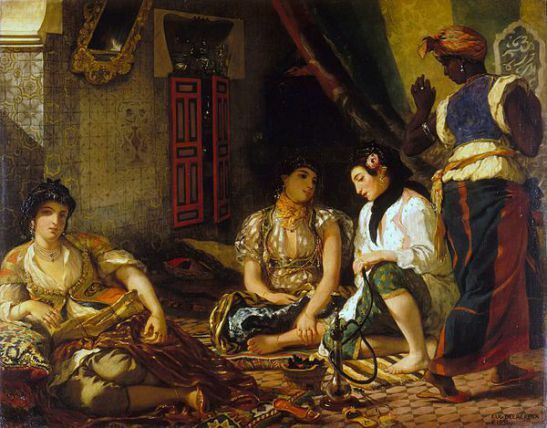 “In the Greek and Turkish places where some new people were taken in and others were thrown out, local people have been left with a swirling mixture of memories and feelings; some reflecting what they have been told to believe and others reflecting their real, lived experiences” (Clark 2007:xvi). As Clark makes the reader painfully aware, one cannot seek to understand the current state and relationship of Turkey and Greece, without reference to Lausanne and “the meaning of Lausanne for the European past and the European future” (xvii). “All over Turkey and Greece, you can see the physical remnants of a world whose component parts seem to have been broken apart, suddenly and with great violence” (Clark 2007:1). Journalist Colm Tóibín’s (1987, 1994) Bad Blood: A Walk Along the Irish Border was another important walking companion, dealing with borders, risk, belonging and the impact of conflict in Northern Ireland. 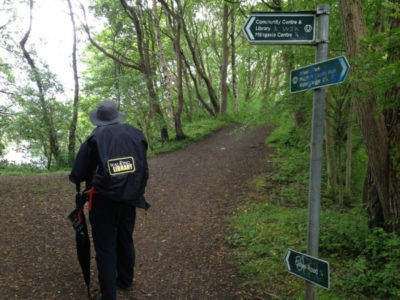 Tóibín walks along the Irish border between Derry and Newry the summer of the Anglo-Irish agreement, reporting on the lives, communities and people he met along the way; the fear and violence, as well as the economic, political and cultural impact of the Troubles. Having just completed four walks in Belfast, I was now about to embark on a walk with John in Chios. 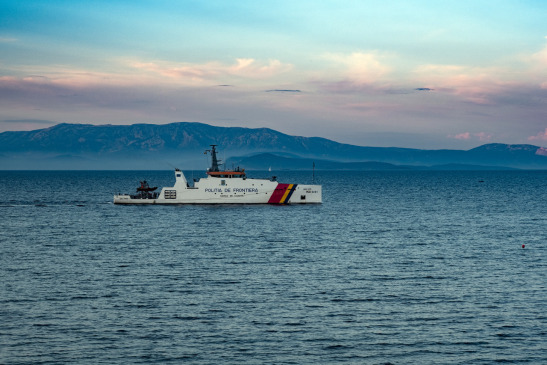 The island faces Turkey and is a frontline transition point for the departure, rescue and arrival of thousands of migrants in often dangerously overcrowded vessels. Greece is viewed by them as the gateway to Europe and a better future. I was keen to hear John’s story and thought that his personal history would, in turn, reflect the history of the region. Drawing upon Sociologist C.Wright Mills (1959), it might also highlight the importance of connecting individual experience with societal relationships and structures by engaging the creative, sociological imagination, through walking biography. I arrived on a charter flight to Lesvos, Mitilene and stayed at the Lesvion hotel overlooking the harbour and took a ferry to Chios the following day. 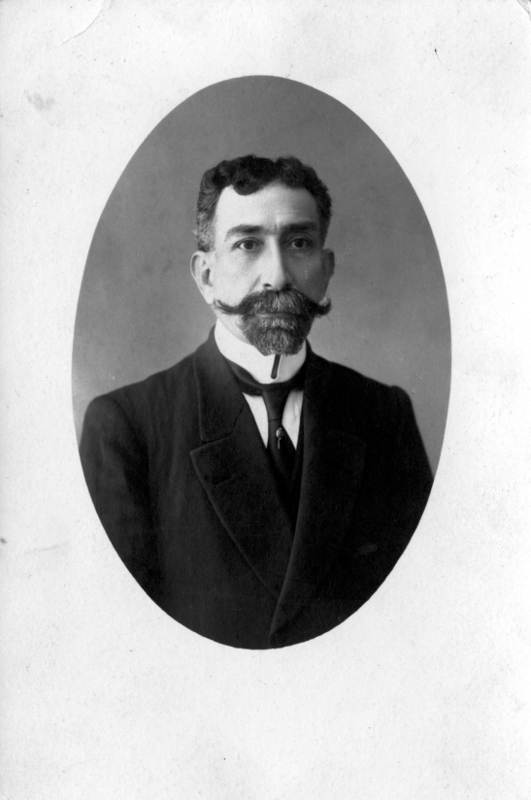 George Delemis, John Perivolaris’s great-grandfather. From John Perivolaris’s archive. Chios, 7th June. Sitting in the Chandris Hotel, in a quiet corner overlooking the pool and right next to the seawall, I asked John to say why he was happy to share a walk and be part of the Leverhulme project. It’s an interesting moment for Greece right now because there’s a major economic crisis combined with the refugee crisis. On the political level, other interesting things are happening in the relationship between Turkey and Greece. In terms of daily life what you notice is tourism. 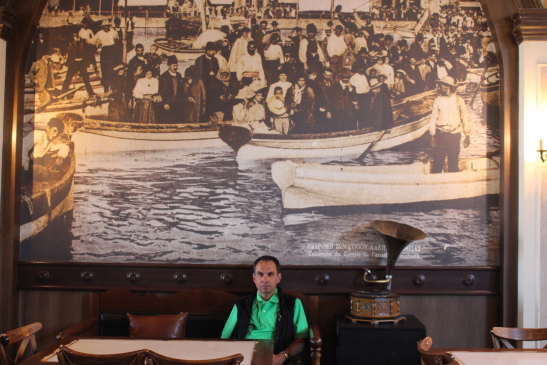 I haven’t been here for over twenty years and the one thing which really struck me was the number of Turkish tourists. Very recently a law has been passed where foreigners, including Turks, are now able to buy properties above a certain value here in Greece, including on what were previously considered frontline islands. As you know, Greece and Turkey have had a close but at times tense relationship, even to the point of war. The relationship between the two countries remains a close one. You cannot begin to understand either country unless you take into account the fact that modern Greece and Turkey were formed at the same time and that the two leaders of those countries back in the 1920s thought of their countries always in relation to the other. Greece and Turkey have always been joined at the hip, going back beyond the 1920s to the Ottoman period and, beyond that, the ancient and Hellenistic periods. Where my family currently has our flat is literally on the coast. You can see Turkey from our balcony, even the houses on the opposite coast. The border between the two countries is clearly visible. One is constantly aware of facing Turkey and I’m sure that the first thing people living on the other side of the Aegean see when they wake up is Chios or Lesvos if they’re living a bit further up the coast. I wanted to do this project because this is a significant place for me in terms of my personal history and my family history. Moreover, it has given me the opportunity to think about certain memories I have inherited from my family about Chios and also my own memories of the place, as well as my new impressions of Chios. The island has changed quite a lot since the last time I was here. An image comes to mind. Unsurprising, since I think in images. If you think in images often you don’t join the images together. I have always carried with me some very strong images of Chios and one of the most persistent images I have is one I didn’t personally witness. It’s an image I inherited from my father. He told me that when he was a little boy he used to stroll in the evenings with his grandfather, my great-grandfather, along the town’s coastal promenade. This faces Turkey and is situated underneath our current flat. My father had a very close relationship with his grandfather, even closer than the one between himself and his father. They used to have long conversations on these walks. My dad must have been around ten, I imagine. My great-grandfather was elderly at that time. During these walks, they would talk. However, there was always one point along the walk where my great-grandfather would go completely silent and they would sit on the low wall that runs alongside the pavement. My great-grandfather would suddenly be lost for words. He’d just gaze out across the water to Çesme, the Turkish town opposite. He was an Edwardian-era gentleman, restrained in his manners. He would have frowned at anyone showing too much emotion. He was a measured person, usually in control of his emotions. At the same time, he had a warm relationship with my father. My great-grandfather was generally liked and respected as a man of honour. A decent, fair-minded sort, by all accounts. On a couple of occasions, my father saw tears in his grandfather’s eyes, silent tears. That image of tears got me thinking… I have this image in my mind of an old gentleman who had come to Chios as part of the exchange of populations in 1922. He was a rich merchant in Smyrna who lost almost everything and came to Chios, where he’d never lived before. A typical experience shared by those who were exiled from their previous lives in Asia Minor. Suddenly finding themselves Greek citizens, they had to adapt to a country they didn’t know, after having lived in Asia Minor alongside Armenians, Turks, Jews, and others as part of the Ottoman world. I have always been haunted by the image of my great-grandfather looking back across the water with a sense of loss and longing. But then you walk up the road, up at the other end, towards the town, there is a monument which we have already walked past several times. This is the statue is of General Nikolaos Plastiras the distinguished general and politician. During the Greco-Turkish war of 1919-1922, in which his personal bravery and humane values were acclaimed, he was known as `The Black Rider’. Plastiras is considered one of the great Greek patriots and his statue characteristically shows him on horseback, facing Turkey. The statue, whose clumsy execution does not do him credit, is big and made of bronze. The political border between Greece and Turkey is literally a fluid one in the North Aegean. It is historically layered and permeated by human loss and displacement, down to the current economic and refugee crises, along the fault line that divides but also joins the two countries. A salty border of sea and tears. What a contrast between the images of a tearful old man at one end of the street and a bronze monument to virile heroism at the other end. The juxtaposition has made me think that my interest in this project probably has to do with the question not only of physical borders but also of the emotional borders that relate to them. 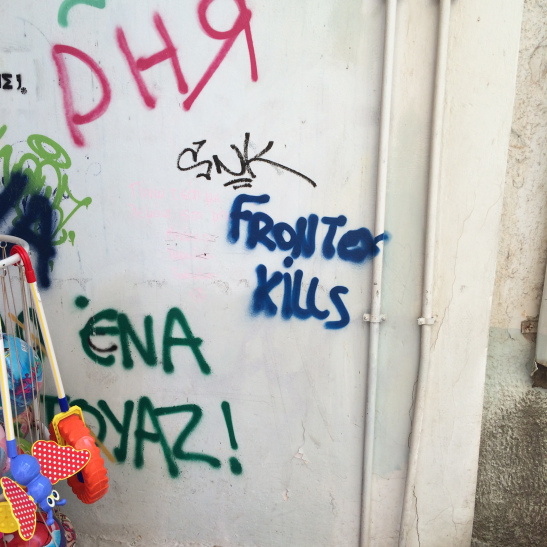 In the context of my family’s history on Chios, there is a tension between physical and emotional borders. I think one of the themes in which I am interested is this question of physical and emotional borders in terms of my great-grandfather, the impact those physical borders, drawn in the twentieth century, had on my grandfather. The drawing of those borders is part of the history of nationalism that resulted in the founding of modern Turkey and Greece. The cost of that process of nation-building was to forget certain things. Nationalism creates a myth of the nation by erasing certain things, being silent about others. Therefore my interest in borders is bound up with my interest in nationalism. Thinking again of emotions and images the contrast between tears and bronze is a strong one. Nationalism wishes, once and for all, to set the history of the nation in bronze, while the border in the North Aegean is a liquid one. The distance between the two coastlines was so short. Yes, I was thinking that the political border between Greece and Turkey is literally a fluid one. Both physically and metaphorically it’s a fluid border, historically layered and permeated on both sides by human loss and displacement, right down to the current economic and refugee crises. A new layer of loss and displacement is added by the recent refugees. What we have is a fault line that divides but also joins the two countries. We were talking yesterday about seas as bridges. I wonder what sort of bridge there is now between Greece and Turkey. If there is a bridge, might it be a broken bridge? 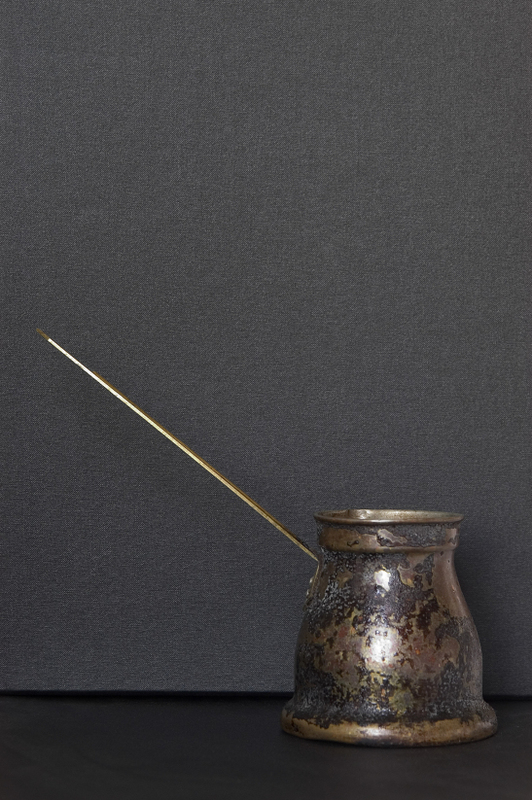 The border is precisely this thing which is liquid and liquid is crossable on an emotional and a human level as well. John told me about someone he knew, further up the coast, who had a café bar. “Suddenly when they were closing up shop at about two in the morning the owner was suddenly faced by a group of refugees who were soaking, a lot of the women with children. They were clearly traumatised. The owner said she couldn’t stop one of the women crying and pleading with her not to kill her children”. Clearly, trauma is the ink with which borders are drawn on maps. If there is a border here in the Aegean, it is a salty border of sea and tears. Thinking in terms of physical space and because I am familiar with this place, I am aware that, due to the force of habit, one runs the risk of being blind to one’s surroundings. Bearing this in mind, I welcome the opportunity this project has presented me to take a close look at specific locations such as the square where the statue of Plastiras is located, to consider the placement of that statue, how one encounters it as a walker. The statue itself has the General on horseback facing Turkey. A partial image of him, sword drawn and confronting the coast of Turkey. 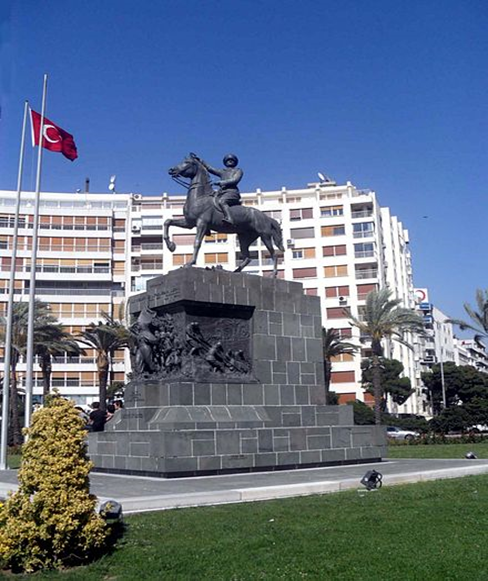 On the other side of the sea, in Izmir, the statue of Plastiras is matched by an equestrian statue of Kemal Ataturk in Cumhuryet Square, facing the Aegean Sea, sword drawn. 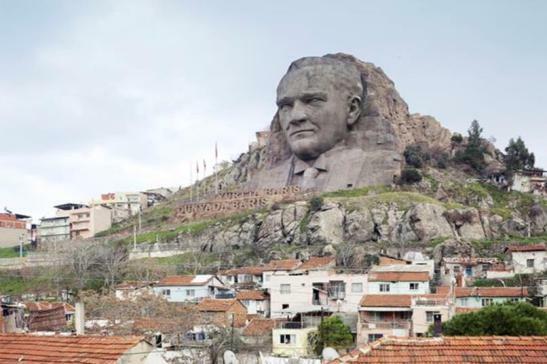 And, since 2009, in Buca Izmir, he has been dwarfed by a 132-foot relief sculpture on the scale of Mount Rushmore of Kemal Ataturk’s head and bust. A perfect illustration of the gendered confrontation out of which nations have all-too-often been born. Moreover, the placement of Plastiras’s statue interests me particularly because it represents a type of nationalism by dint of blocking out history. At the same time as he is pointing to the coast of Turkey the view to the latter, what you actually see from the pavement, as opposed to his elevated view on pedestal and horseback, is a concrete block of ruins. In fact, a 1960s-built concrete building and a line of unkempt trees beside it, blocking the view. A near-perfect metaphor for nationalism, the implication is that the historical myth of nation is always contradicted by existential reality as lived on the street. Listening to John made me think about the concept of internal borders and what happens when you are torn or expelled from your sense of home and belonging, located somewhere else, as is the case with the population exchanges and the refugees seeking new lives in Chios. You have to forget certain things or repress certain things in order to be, live, survive and make a life in the new situation. I was thinking that everything John had said about the building of a nation can also be related to a person’s biography and how a sense of being and then building a life happens – life stories, autobiographies can be really potent in that respect as well. There is no place for a voice to be heard. There is no place from which you can speak. There is no one to whom you can speak because the subjects to whom you are speaking in the case, let’s say, of my great-grandfather, are Greek citizens and the nationalistic idea of being a Greek citizen for that generation who were exchanged was an unsettling novelty. Those who arrived in Greece from Asia Minor in 1922-23, were born somewhere else and as something else. They didn’t fit into that body, that thing, that identity of a Greek citizen. The fact that my great-grandfather was rendered silent is not, I think, just because of emotion, but because he did not have a place from which to speak. Our walk in Chios through time, place and memories was also a conversation between John, his father and his great-grandfather. 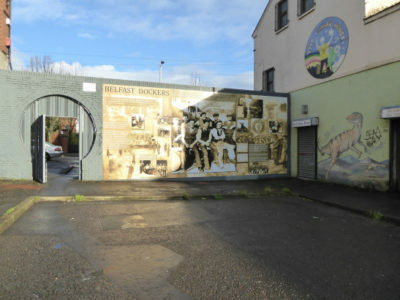 Our conversation makes me think about the importance of ‘working through the past’ as a theme that has also arisen in two of the Belfast walks. Embedded in these walks we are taking is the continuing conversation between my great-grandfather, my father, and me, spanning three generations. My father was born in 1928, shortly after the exchange of populations, but my grandfather is very much of another world, which is the Ottoman and immediately post-Ottoman world. Meanwhile, I belong to the generations of the post-WW2 diaspora, having been born in Canada, and grown up in England. John goes on to say he is also thinking across the generations and about younger Greeks today. We are now at a juncture when young Greeks in their twenties are leaving the country[i]. I’ve seen figures quoted in the region of forty per cent of educated young Greeks who are currently emigrating. Anecdotally, I come across them all the time in London. When I speak to them there they do not give the impression of being particularly traumatised. It seems to me that, on the one hand, we are living through a period where there is a resurgence of nationalism but, on the other, the younger generations of Greeks – of a certain class, to be sure – give the strong impression of being in many ways post-national. Traditionally the Greek middle-class would have been very nationalistic, whereas the younger generations are, in many ways, post-national in their attitudes. This new middle-class of Greeks, who speak several languages and have probably been educated abroad, is not a particularly privileged class. They represent a broad middle-class, whose parents, typically saved or borrowed money so that they could send their children to study abroad. They might be considered part of wider Erasmus generation in Europe. For them, the idea of nation if not ridiculed is definitely resisted and thought of as something dangerous. After all, didn’t the idea of a European community emerge because of the tragic history of nationalism in the region? This is something that Brits will never fully understand because they were never occupied during the War. In terms of class, what’s interesting to me is what happens with the refugees. A lot of Syrians in the camps are educated, middle-class professionals who are able to afford to pay smugglers and to get out of the country. Reputedly, one of the best interpreters on Chios at the moment is one of the Syrian refugees. He is multilingual, with excellent French and decent English. Undoubtedly, those affected by the Syrian war who are not of the more prosperous middle class, are forced to seek refuge within Syria or in Syria’s neighbouring countries. Moreover, the physical, as well as emotional, borders between Chios and Turkey are also intra-psychic. What also emerged in our walks were the layered material traces of the island’s history, visible in the buildings and city walls. 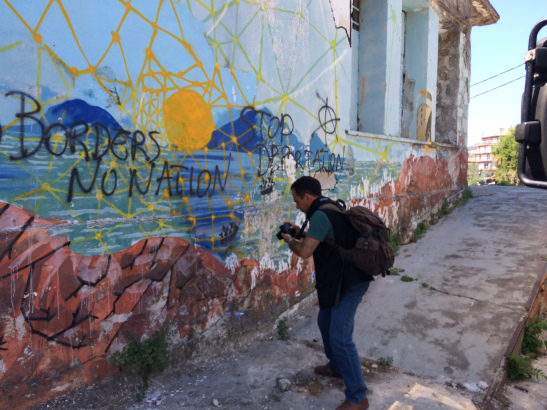 Souda refugee camp abuts the outer wall of the old town of Chios. Just off the harbour, the medieval town was initially constructed as a citadel by the Byzantines in the 10th Century. The surviving structure dates back to the 14th century and was largely built by the Genoese, who ruled the island until the 16th century. It was then occupied by the Ottoman Turks until 1922, with the exception of its six-month occupation by the Venetians in 1694. Post-1922, it was largely occupied by Greek refugees from Asia Minor, including the maternal side of my family. The current refugee camp, next to the walls of the medieval citadel, is another chapter of the refugee experience on an island of refugees. The refugee camp itself is physically situated in an in-between space by the wall of the citadel and the main town, not inside the old town, not exactly outside it. The refugees are living in tents in a transitory, in-between space. 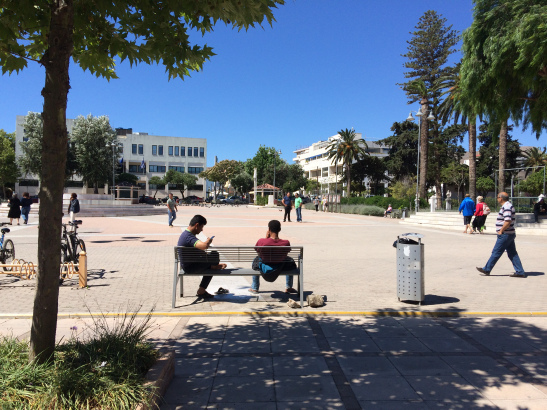 The camp is also next to the town’s main square and its small park, which refugees use as a more congenial place in which to stretch their legs, socialise on the benches, and wait for their appointments at the Town Hall, which is across the road. John’s narrative evoked strong images and we return to the earlier conversation about thinking in images. Both us were influenced by the work of Walter Benjamin who was an absent companion along our walks. So too, for John, was W. G. Sebald. I’ve been thinking a lot about Benjamin via Sebald. I feel very close to their ways of working. Photography plays a central role in their writing. In Sebald’s Austerlitz (2001), the eponymous protagonist is one of the children sent to England as part of the Kindertransport. At one point, as a middle-aged adult, he goes back to the Continent, researching old films in an archive with the intention of finding images of his mother. In a Nazi propaganda film, he thinks he catches a glimpse of her but it’s very strongly suggested that actually, it is not she, but that he’s building a semi-fictional history out of fragments of image. Sebald did that himself, in that he used to go to jumble sales and pick up photographs, using them to weave ostensibly autobiographical stories around these. Partly what we are doing here is discovering the past in the present through fragments of memory and photographs, old and new. Equally, Sebald’s Rings of Saturn (1995) is about walks on the Suffolk coast. Photographs also interrupt the text of that book, with the photographs presented as mysterious objects that generate narrative but are not trustworthy as evidence. They might be compared to the role of the historical fragment in Benjamin. Something you have to confront and in that confrontation a spark ignites between you and the fragment. In his terms, the momentary flash disrupts the official narratives of history, offering the fugitive possibility of rewriting it. That is why I have chosen the photograph of my great-grandfather as the first image here. The photograph of him is taken in a professional studio, with my great-grandfather in a conventionally formal pose. The account I gave of him in tears goes against the grain of this photograph because in the photograph he presents himself as the perfect Edwardian gentleman. 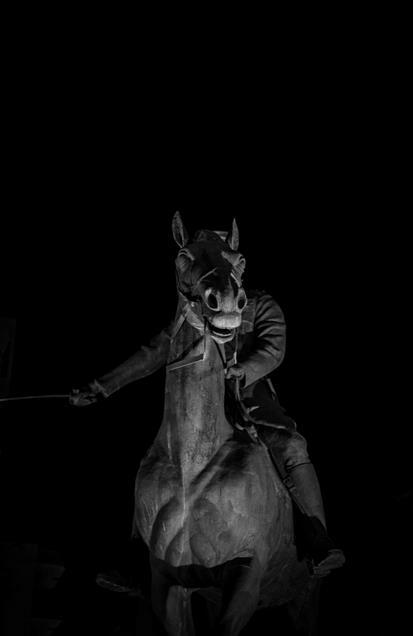 Alongside that, I have also included here an image I took at night of the statue of General Plastiras. They are both masculine images. It is important, I think, to consider the gendering of history and biography in relation to these images, and also nationalist stories based on the idea of strong men bringing order to history and the nation, whether it be Greece or Turkey. While we are on the subject of the gendering of history, it is worth remembering the role of women in passing down cultural memory. They have often done so through storytelling. As you know, I have never lived in Greece. My connection with family history and, to a large extent, popular culture were those summers I came to Greece as a child before there was television. Television was first broadcast in Greece in 1966 and with limited hours of programming. In the evenings you didn’t watch television, especially since there were frequent power cuts. In fact, I would say reliable electric lighting is the one thing which has destroyed storytelling, since what used to happen was that, at night, we would either sleep over at my grandmother’s or she would come over and sleep with us. During those starlit summer nights, on the balcony of either her house or our flat, she’d embark on epic stories, skilfully told in instalments that lasted a full month or even two. Therefore, I can vouchsafe from my own childhood experience that there are History and her stories. Yet again, we can acknowledge that treaties have most often been signed by men and that history has largely been written by men. Nevertheless, there are enormous blind spots. It is the blind spots I find interesting and that’s where old stories and old photographs come in I think. I have also been thinking about material culture, the bronze statue of General Plastiras, the concrete ruin opposite. Concrete in Greece has a specific historical weight. There is a marvellous book, Concrete and Culture by Adrian Forty (2012). Forty observes that concrete often signifies modernity. 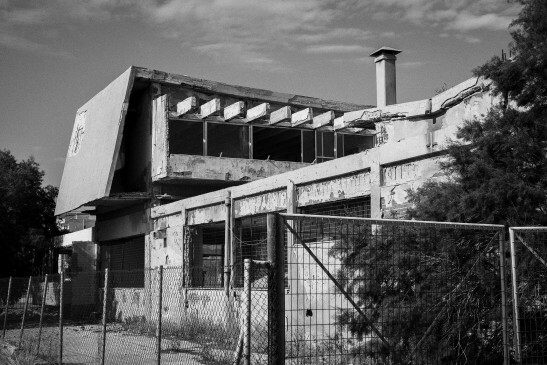 In the context of Greece, concrete becomes an architectural lingua franca in the 1960s. Modernity in Greece is marked by poured concrete and television. As a lot of those 1960s buildings are in ruins, we might say that Greece, architecturally, is in a phase of post-modernity. 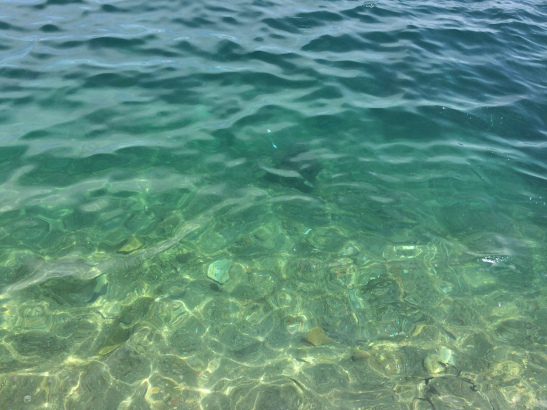 The other material of which I have become intensely aware since coming back to Greece is colour, especially the intense blue of the sea and sky. I have felt blissfully immersed in blueness. I feel I have conveyed a sense of this in the very blue picture above of the coast of Turkey with a border patrol ship going across. We walk from the Chandris Hotel along the side of the harbour towards the centre of town. Our destination was to be the town hall, but first a walk through the town. I remark on the sensory experience, the noise, traffic and divine smell of a bakery. We were going to buy some figs and oregano and John wanted to show me some street art. 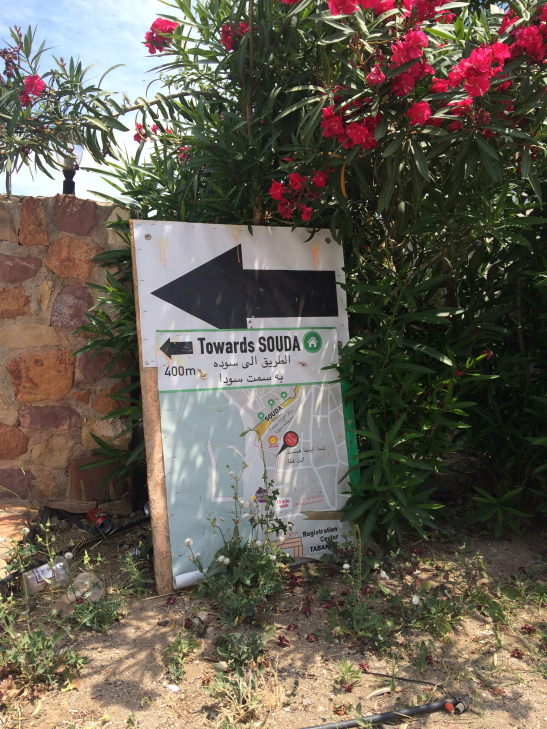 We walked towards the old city walls and past some cafes nearby, behind which were UN tents and the Souda Refugee camp. Traditionally these cafés have been working-class cafés. Being situated near the bus station, the bus drivers, conductors, and passengers come here. They are open virtually all night and they are places where there are hardly any women. The men here are of a certain generation. Younger people wouldn’t think of coming here and older men come here to drink ouzo and eat meze. The square and long narrow park behind it mark a border. On one side are the working class cafes and behind them the medieval citadel and refugee camp. On the opposite side, is the town’s main shopping avenue and the grand house of my great-grandfather. This is now a bank. The contrast between the sides of the square tells you everything you need to know about class. 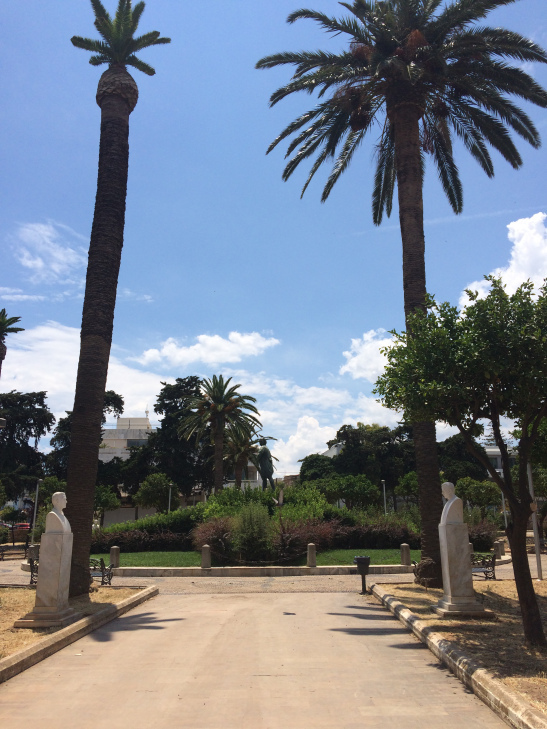 The square and park mark the frontier between middle-class Chios and working-class Chios. Walking along the working-class flank of the park, which is lined with rudimentary general stores and other stalls, I say ‘you can get everything you want on this street, even a parrot’. It was incredibly hot and the breeze was very welcoming. We had approached a monument, right next to one of the access points into the camp, not the main entrance but a side entrance. 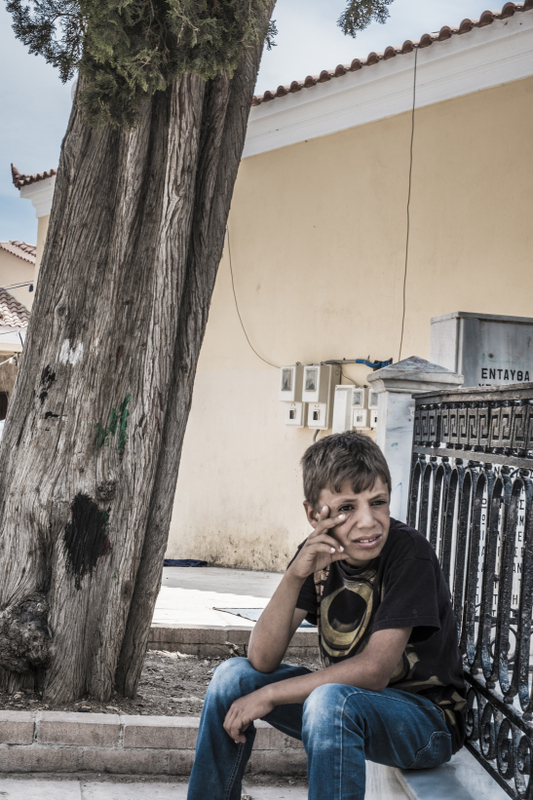 A young boy, a refugee, was sitting by the monument looking into the distance. Here’s another site of historical layering, this is the monument to the Independence Fighters of 1822, around the time Lord Byron joins the Greek War of Independence. The independentists listed here were mostly well-to-do young men educated abroad, and inspired by French Enlightenment ideas. For example, listed here are several scions of the Mavrogordatos and Petrokokinos dynasties. These were noble families from Kambos. This is immediately to the south of Chios town, an area of citrus orchards and Genoese mansions. One exception was Constantine Kanaris. There is a prominent statue of him in the park across the road. 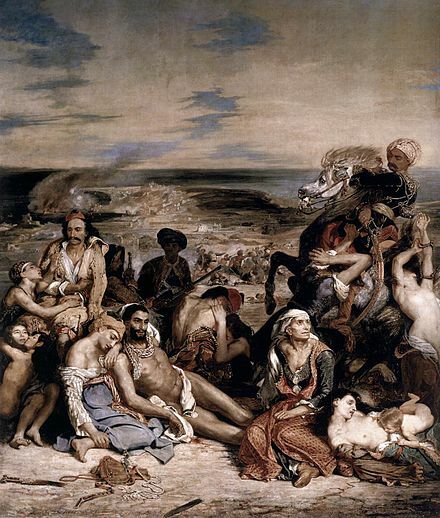 Of humble origins, his fame rests on his blowing up of the flagship of the Turkish admiral Nasuhzade Ali Pasha (or Kara-Ali Pasha) in revenge for the Chios Massacre. 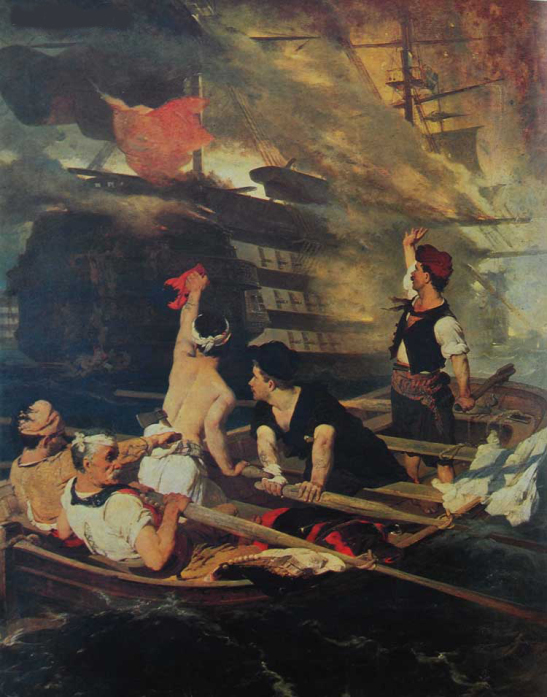 Painting by Nikiforos (1836-1904) of the attack to the Turkish flagship by a fireship commanded by Kanaris at the island of Chios. John motioned to me to look past the monument towards the refugee camp. As you look through here you’ve got the monument in front and the refugee camp behind. I can see a lady in a sort of black veil in the doorway at the end. She is on her mobile phone and then, through the doorway, you can actually see the walled town. One sight line reveals several periods of history. It is an intense moment in our walk, made so by the presence of the boy sitting on the side of the monument. I say “I hope he’s with a family and not on his own”. John fears that he has captured an image of displacement, showing an unaccompanied child with no place to speak from and nobody in place to whom he might speak as a child. Looking off-frame, to where and to whom does this boy look? We walked towards the entrance to the camp. The camp was located in the space between the old city walls and the harbour. One side formed by houses and the backs of bars and the other side the city wall or harbour. We had heard about a fire in the camp the day before. Everywhere where the refugees have been placed is peripheral. Peripheral transition points between different parts of the town. Some refugee children passed us on bikes. The barrier is up and people are passing in and out of the camp the day after the fire we heard about yesterday from two archaeologists. I was suspicious of their breathless use of words such as `riot’ to describe it and `fascists’ to refer to those who had allegedly acted as provocateurs. It is interesting that Greeks would immediately resort to the latter term. Other Europeans might use the term “neo-Nazi”. However, the term of reference for a Greek would be the Civil War (1944-45, 1946-49). Fascism has a long history in Greece since the 1930s and using the term “fascist” struck me as old-fashioned, implying a state of being stuck in the past, haunted by its ghosts. John pointed to the refugee camp. We were able to get a good view of the extent of the camp from our position standing behind a row of houses overlooking it. A section of Bruce Clark’s book that really interested me was where he describes the founding, as a result of the 1922 exchange of populations, of many of the precursors of international aid agencies we recognise today by larger-than-life figures such as Fridtjof Nansen and Hans Morgenthau. We carried on walking and John was reminded by the scene of his first photographic project with asylum seekers. I was eighteen when I took my first photograph of a refugee. Classic documentary. I accompanied a nutritionist assigned to Sopley refugee camp, which was where many of the Vietnamese boat people assigned to the UK were received. A large part of the diet provided for them was based on dairy products: cheese, milk, yoghurt. The Vietnamese, like many people from Far East Asia, are milk intolerant. That was why a culturally aware nutritionist was assigned to the camp. Having shot that story in 1980, the son of one of the men I photographed at Sopley contacted me a few months ago. He found my photograph of his father on one of my websites and was moved to contact me since there were so few photographs of his father and none of that period in his life. The son sent me a few photographs of his father taken after he had left Sopley and settled in London with this family. The last picture was of a recent family reunion. The whole family was there, including his mother. His father was absent, having passed away. This brought us back to Walter Benjamin and the idea of the spark of the new and the photograph being the mediation or spark of the new and the role of images and photographs in life stories, in people’s biographies and the stories they tell about their lives. John pointed out another view of the coast of Turkey. The colours were intense, the sea, the sky and the harbour with the camp sheltered by the old city walls, at the edge of the new town. A moment and a location resonant of the layers of history John had shared through the multi-generational story of his family. 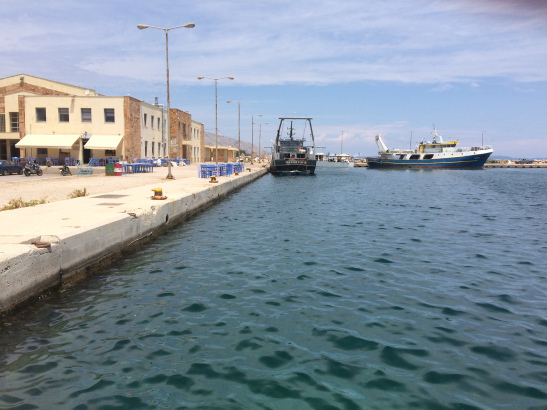 We sat by the harbour, adjacent to the camp I asked John how he felt returning to Chios after 23 years. I have enjoyed staying in my mother’s flat. I ask about the ornaments and photographs belonging to his mother, which I observed in the flat. I realise when John answers that I was projecting my own feelings onto the space and my feelings on returning ‘home’ to my mother’s flat. The objects in my mother’s London flat have made more of an impression on me due to the whole business of the immigrant’s unceasing accumulation of objects reminiscent of one’s place of origin. That is why it must be awful to be a refugee. The experience is one of a complete break with the past, of travelling without the stuff one would normally carry in one’s pockets. The experience must be one of naked exposure to alien environments apart, perhaps, from the pictures carried on the one vital piece of equipment for the refugee: their mobile phone. Now apart from this business of mobile phones which fascinates me, a photojournalist friend of mine, Geert van Kesteren, did this wonderful project on Iraqi exiles and refugees and the stuff they carried, the photographs they carried on their mobile phones. Review of Geert van Kesteren’s Baghdad Calling (2008). My mother’s London flat is a sociological study in itself. 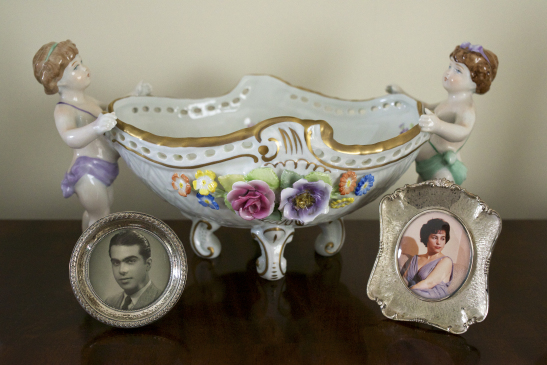 At one point I was considering photographing her arrangement of objects and photographs. 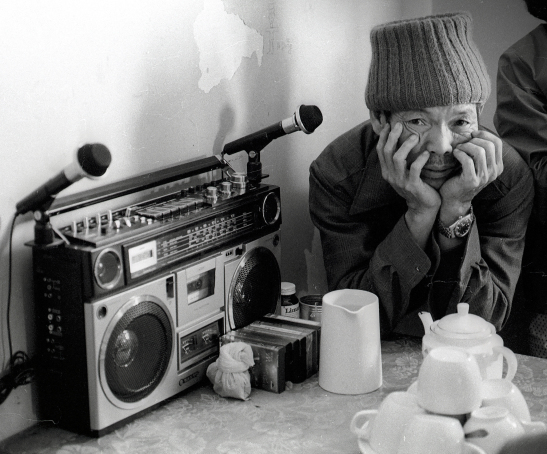 A typically immigrant aesthetic is at play. My daughter immediately picked up on it at an early age. She always treats her grandmother’s flat as a kind of museum or art gallery, displaying a unique sensibility. I say I know exactly what John means as feel similarly with my Mum’s flat and the Catholic iconography. Going back to my mother, there is a corner of her flat where she keeps icons. At the right time in the morning, you can catch her praying in front of them. However, I have to confess that, even though I am not religious, I travel with a small icon of St George I inherited. Once in Prague, I temporarily lost my bag. As I listed its contents at the local police station, it struck me as strange that someone of my age should carry a miniature icon of St George slaying the dragon. I say I have a medal in my purse, from my Mum. Yes, I can understand it perfectly, yes. We sat on the harbour wall, observing the daily routine of the refugee camp. A family walked towards the shelter of some trees. Women gutted boxes of fish on the ground. John pointed out a tavern near the harbour. This is one of the best places on the island to have fish because it literally comes straight off the boat. Quite nice at night too, because everything’s lit up. Although I wonder what sort of business he’s doing now if anybody is coming here now. Nevertheless, he’s got his tables out. It’s not one of those businesses that would go out of business because the owner is a fisherman himself. The restaurant is a sideline, providing additional income, I expect. The gulls are flying over hopefully. You can see the wind turbines very clearly in Turkey at the moment. On a longer stay, it would be worth just catching the ferry and going to Çesme for the day. And, if you were staying even longer, getting the bus and going to Izmir. We walked back to town through the park opposite the town hall. Our conversation about the population exchanges was sparked by the view across the sea to Turkey and looking at the heroic statues of Chiote patriots, that surrounded us. A petrified gathering of local poets, doctors, soldiers, writer, and scholars spanning the Greek War of Independence and post Second World War periods. On the third day of our walks in Chios, we were due to meet an aid worker we had been introduced to us through Information Point Lesvos. First, we tried again to see the town official who would provide us access to the camp. It was another false start, we waited for the official for some time and then gave up to go and meet the aid worker for coffee. We sat in the square next to the park and the town hall. The aid worker told us how she had gone on holiday to Lesvos, saw the situation and felt compelled to help and volunteer. She had taken leave of absence from her job and initially went to Izmir in Turkey to work and was now in Chios. She told us that in Turkey the situation was very bad for refugees. Aid workers are not allowed to gather in numbers. If they do they are harassed by the police. According to her, houses, where aid workers were lodged, were also occasionally raided for no apparent reason. She was able to tell us more about the disturbance in the camp. She said that some young men were on hunger strike and one young man who had been in need of shoes for some days was given a pair, but they were too big. In anger and frustration he exploded, others got involved and encouraged by some other young men the tent was set on fire, and the general provision tent with blankets and wheelchairs went up in flames too. The young men were arrested. In response to a question about women’s safety in the camps she said that women there tended to help each other and she had not heard of men going into women’s tents, or of other safety issues. According to her, the bigger tents are overcrowded, making it difficult to sleep. The smell is terrible. What was shocking to us was the statement that people were choosing to go back to Turkey because they found the conditions intolerable in the camp. The fire contributed to a climate of fear compounded by the inevitable trauma involved in escaping from war zones. She walked us through the camp. On entering the camp we learned that parents were generally happy that their children were going to school although, due to legal reasons, the term ‘children’s activities’ was generally used rather than school. The children were all given ‘backpacks’. We saw them when we were leaving, a snaking line of kids returning to the camp. A small girl came up to us and said ‘hello’, held my [Maggie’s] hand, and hugged me, then said ‘bye’ and went on her way. We walked through a line of tents on the left and right, a wire fence was in front of the tents on the right. Washing had been hung to dry on it. Many of these tents were makeshift with UNHCR material, sheeting and the blue cloth of the Samaritan Purse charity. We walked past the toilet blocks and the showers all in a row and a water point with large sinks. Water was freely available for drinking and there were phone charging points too. 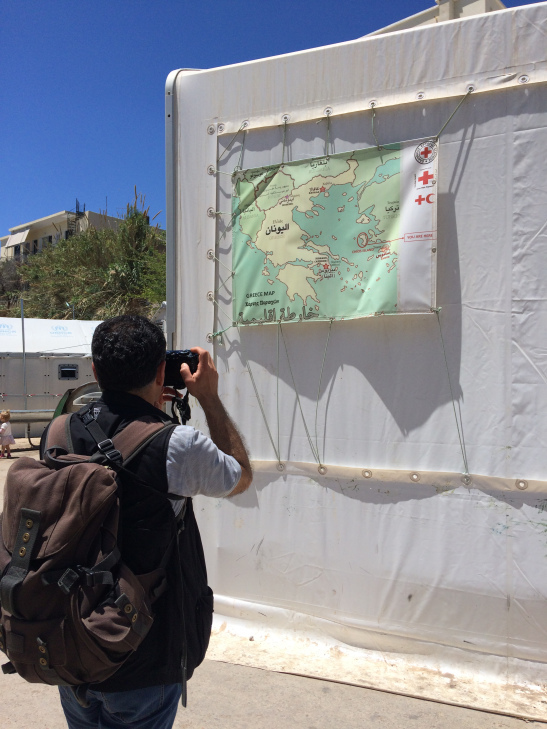 We stopped by a large map of the camp that told the resident where they were in Greece. Our attention was caught by the commotion of a small crowd gathering nearby. They were looking out to sea. We walked towards them and a Palestinian man came over to us. He told us that a young man had jumped into the water, intending to swim to Turkey, from where had initially swum to Chios. Because he had not arrived by boat the authorities would not process him. We had seen the young man two days before, an amputee, his foot missing and dressed in a dirty, thick white bandage. He was pacing agitatedly about on crutches. He finally had had too much and declared that he would swim back from whence he came. The Palestinian man’s wife joined with their baby, aged around 18 months and asleep. The husband said he was ready to go back to Haifa but his wife wanted to continue their journey into Europe. The aid worker who walked us through the camp left us to continue with her duties. She told us that women were choosing formula milk rather than breast milk, as due to stress their milk had dried up. This was creating further health problems because a formula is not as clean as breast milk. We were joined by another aid worker who told us that he and two volunteers, a North American translator of Arabic and a young Afghan refugee were helping people to prepare for their asylum interviews. So far they had been successful with eleven of these but two went to appeal. We were told us that there were about forty unaccompanied children, from Afghanistan, Syria, Pakistan, Turkey and two from the DRC. The unaccompanied children were mostly boys since girls tended to be adopted informally by refugee families. Furthermore that some of the unaccompanied young people were living in a big tent in proximity to adult men, described to us as being of ‘criminal’ backgrounds. Consequently, the young men had formed gangs to keep safe. This has led to their engaging in petty theft, minor misdemeanours, and, in a minor way, in the recent fire. The young men involved in the fire had been arrested. We were told that the ordinary behaviour of adolescent young men was exacerbated by the circumstances of their refugee existence. An aid worker who spoke to us also believed that the disturbed young amputee’s attempt to swim back to Turkey was a cry for help. He also told us that a young man who had tried to commit suicide in the camp was returned from hospital to the same tent where he had tried to commit suicide, thus placing him in the same circumstances that had led to his suicide attempt. After two days back in the camp he successfully requested to be returned to Turkey. The aid workers to whom we spoke identified several pressing needs, including translators and interpreters, food donations, social media campaigning, and lobbying of European politicians. Our conversation on leaving the camp was focused on the material, symbolic and intrapsychic borders we experienced there, the borders between people and the watery fluid border in front of our very eyes, where the young amputee had attempted his desperate swim back to Turkey. We were walking along the strip of land bordering the sea and the town, a place where people waited in limbo for their claims to be processed. Then there were the mute historical layering of the very walls and stones around us, constructed from fragments of ancient Greek, Byzantine Ottoman, and Genoese buildings, out of which the Old Town of Chios is built. 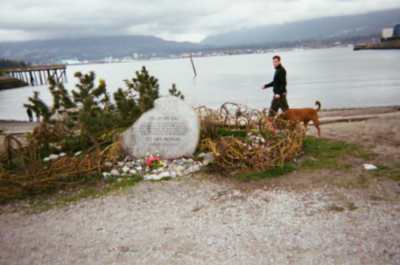 The walk had enabled me to connect with John’s biography, cultural history and familial experiences of the ‘population exchanges’ and the long, turbulent history of refuge and forced migration to/from Greece and Turkey. The current humanitarian and refugee crisis, austerity politics and experiences of Greek citizens, alongside what John described as a paradoxical ‘cultural renaissance’ Greek arts and literature were experienced in an immediate, sensory and multi-modal way – not only in our walks and conversations around the theme of borders, risk and belonging, but also through the lens of Irish journalist Bruce Clark’s research and the collection of contemporary Greek poetry called Austerity Measures (2016), edited by Karen Van Dyck. 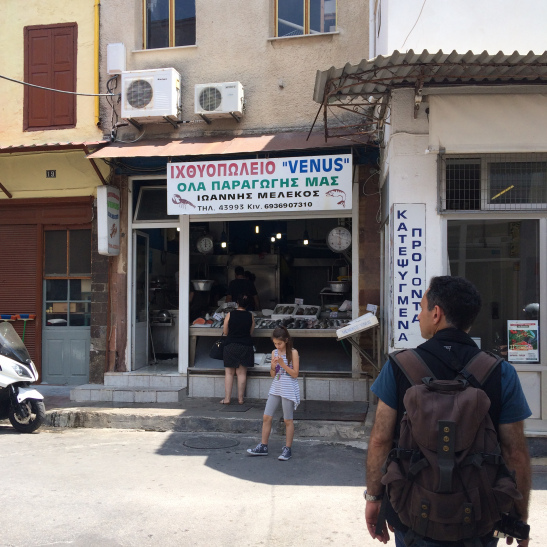 The links with Colm Tiobin’s walk along the Irish Border was also symbolic, in part, of our walk, connecting the here and now in Chios with the then and there of the politics of the Irish Border. We met some brave and resilient people, volunteers and migrants in both ports. Both of us were touched by the meeting with the refugee boy by the monument. We also had frustrating encounters with local bureaucracy and on arrival very late back to the UK; the theme of borders, risk and belonging was played out in our airport hotel, a temporary accommodation for refugees. [i] According to Kevin Ovenden, “from 2008 to Syriza’s election victory  some 200,000 young people left Greece in search of work abroad” (Syriza: Inside the Labyrinth, London: Pluto Press, 2015, p. 45). Next article Walk 10. Walking with sociologist Linda Connolly in Cork.